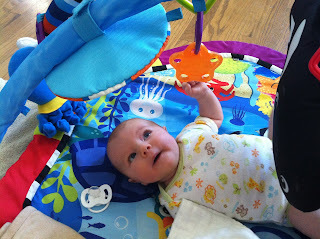 I never realized how much fun a two month old could be! Guinevere smiles and coos and is generally much more responsive and alert than in the early newborn phase. I’m actively trying to memorize the way my adorably cuddly baby feels in my arms because I know she won’t be this small for long. She’s now officially out of newborn clothes (though there are still a few that fit her), and fitting the 0-3 month clothes perfectly. I think we’re to a point where we are starting to get into a pattern with sleeping . . . hopefully it continues. I’ve found that we have the best results when we bathe her and put her in her sleeper after whatever feeding is closest to 6 or 7pm. If we don’t do that, then we run the risk that she will fall asleep for the night and still be in whatever onesie she was in all day. She was never a fan of swaddling, but she definitely sleeps better in a sleeper, with her arms and legs covered, than in a onesie where her arms and legs are exposed. Guinevere doesn’t have a set bedtime, but seems to fall asleep naturally sometime between 8-9pm. Anytime I try to purposely put her down by a specific time, it backfires on me. She’ll get fussy and stay up and I’ll get frustrated. Since I’m still on maternity leave, there’s no urgency in putting her down by a specific time. Letting her fall asleep on her own terms so far seems to be the least stressful way of doing things, and if she follows her current natural bed time schedule, that will work out fine for when I go back to work next month. The last two nights, Aaron and I actually had a little bit of grown up time after we put her to sleep. Now if only I could stay awake past 9:30 . . .
She tends to wake up around 3 or 4am for an early morning feeding. However, night before last she actually slept the entire night – from 9pm-5am! Then she made up for it last night, waking up for feedings at 1am and 5am. But honestly, I’d rather her do that than the 3 or 4am feeding, if for no other reason than it’s really hard to tell her smiley, happy face to go back to sleep. She almost always wakes up with a huge smile on her face. 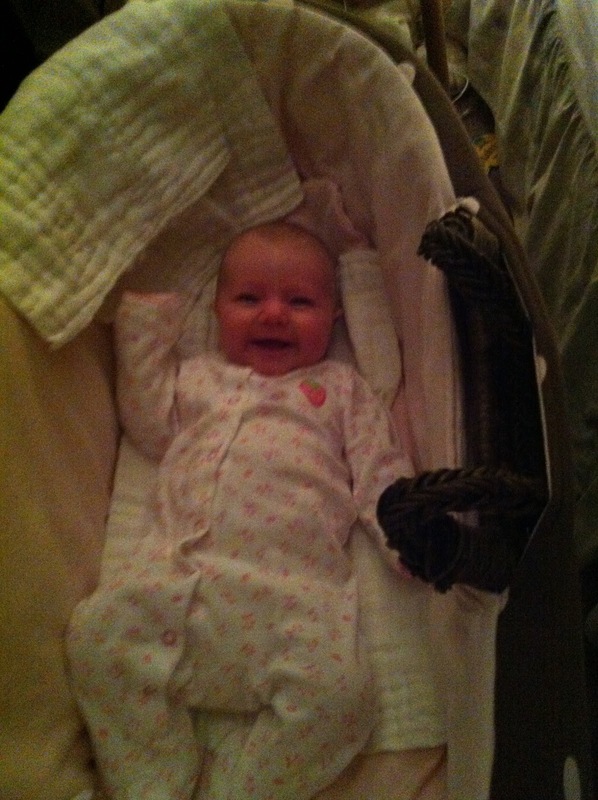 Smiley, happy Guinevere at 4am. 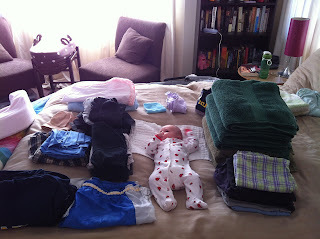 I think my favorite part of this age, though, is that Guinevere is not mobile yet. I can set her down on her play gym and leave the room for half a second and she’s still in the same place when I get back. She’s old enough now that she doesn’t freak out if we go 5 minutes without holding her (most of the time); in fact, she kind of likes looking around whatever room she’s in and exploring it with her eyes. I am very cognizant that this will not last forever, and am trying to enjoy it as much as possible while I can. Yesterday, I was able to lay her down on our bed while I vacuumed and cleaned the room. It was amazing! She loves laying on our bed while I fold laundry around her. She’ll stare at the ceiling fan or make faces and smile at me or “talk” to me. I love talking to her! You can see her studying my mouth moving as I’m talking, and see in her eyes that she’s trying to figure out how to do it too. Then she’ll open up her mouth and experiment with various vowel sounds. How I get my laundry done these days. It’s so fun watching her find new things to stare at! I put her down for a nap in her crib the other day, and she looked up at the mobile that has been above her crib since day one, but she truly saw it for the first time. It was amazing to see her discover it! She now likes to have “conversations” with the stuffed Shamu on her play gym. She’s also discovered the mirror. Babies and mirrors are a great combination! When Guinevere catches her reflection in the mirror, she is fascinated. She stares and smiles and gets excited. I’m excited to see her grow up and learn new things, but I am definitely enjoying this age. Guinevere staring at herself in the mirror. Seeing your own baby growing is the most beautiful feeling of the world. The writer explains her emotions in this aussiewritingreviews.com about her baby. She was not believed that her baby is grown in a very decent way and put a beautiful smile on her lips.